In this lecture series, John Walsh examines the ways van Gogh’s interests and abilities developed during his short but brilliant 10-year career. Vincent van Gogh (1853–1890), the most famous European artist of the 19th century, created a body of work and lived a life that fascinate audiences everywhere. This was an artist who responded to his subjects strongly, sometimes rapturously, and found the means to translate those responses onto paper and canvas. In six lectures, John Walsh, B.A. 1961, Director Emeritus of the J. Paul Getty Museum, Los Angeles, and Visiting Professor in the Department of the History of Art, examines the ways van Gogh’s interests and abilities developed during his short but brilliant 10-year career: how he created a visual language to achieve the effects he wanted, how his intentions changed over the course of a decade, and how encounters with other artists, relocations, and spiritual crises turned him in new directions. After an unpromising start in life—high school dropout, apprentice art dealer unsuited to the business, Calvinist lay missionary in Belgian coal mines—van Gogh committed himself to becoming a painter of Dutch peasant life. Largely self-taught, he spent five instructive years of unremitting effort in the Netherlands. He then went to Paris, where his subjects and style changed radically over his two years in the city thanks to the influence of his Post-Impressionist contemporaries. Van Gogh then moved south, to Provence, and found the conditions he needed for his artistic powers to expand and mature. Despite bouts of mental illness, he produced a vast body of work in less than three years. Though he had been seen as a fringe figure during his lifetime, his importance was recognized very quickly after his death in 1890. He soon became famous for the expressive power of his pictures and the courageous persistence he applied to his work, both of which were influential for generations of younger artists. 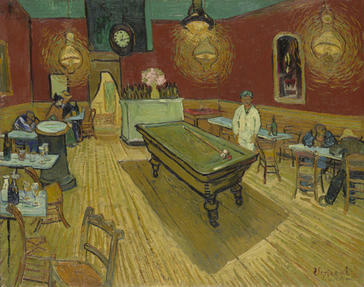 Walsh explores many aspects of van Gogh’s work: his Dutchness, his spiritual and artistic ideals, his unsurpassed drawing skills, his imagery, and the evolution of his distinctive painting techniques. In each lecture, Walsh singles out several works to treat with particular care, showing how they represent turning points for the artist. Van Gogh wrote frequent letters to his brother, the art dealer Théo van Gogh, and this correspondence is the main source of information about his inner thoughts and artistic intentions. A rare literary achievement in their own right, the letters figure prominently in the lectures. Note: All lectures are held in the Robert L. McNeil, Jr., Lecture Hall. Seating is limited. Doors open one hour prior to each lecture. From the vast literature on Vincent van Gogh, the lecturer has chosen several books and catalogues that are especially useful, relatively recent, and readily available for purchase, either in bookstores or through online used booksellers. de Leeuw, Ronald, ed. The Letters of Vincent van Gogh. London: Penguin Books, 1997. Schapiro, Meyer. Vincent van Gogh. New York: Harry N. Abrams, 1950. Latest ed., Abrams, 1994. Schröder, Klaus Albrecht, ed. Van Gogh: Heartfelt Lines. Cologne: DuMont, 2008. Sund, Judy. Van Gogh. London and New York: Phaidon, 2002. Welch-Ovcharov, Bogomila. Van Gogh in Perspective. Englewood Cliffs, N.J.: Prentice-Hall, 1974. Bailey, Martin. Starry Night: Van Gogh at the Asylum. London: White Lion, 2018. Bailey, Martin, The Sunflowers Are Mine: The Story of van Gogh’s Masterpiece. London: Frances Lincoln, 2013. Bakker, Nienke, Louis van Tilborgh, and Laura Prins. On the Verge of Insanity: Van Gogh and His Illness. Amsterdam: Van Gogh Museum, 2016. Dorn, Roland et al. Van Gogh Face to Face: The Portraits. New York: Thames and Hudson, 2000. Druick, Douglas W., and Peter Kort Zegers. Van Gogh and Gauguin: The Studio of the South. Chicago: Art Institute of Chicago, 2001. Helvey, Jennifer. Irises: Vincent van Gogh in the Garden. Los Angeles: J. Paul Getty Museum, 2009. Heugten, Sjraar van. Van Gogh and the Colors of the Night. Amsterdam: Van Gogh Museum, 2008. Heugten, Sjraar van. Van Gogh Drawings: Influences and Innovations. Arles, France: Actes Sud/Fondation Vincent van Gogh Arles, 2015. Kendall, Richard, Sjraar van Heugten, and Chris Stolwijk. Van Gogh and Nature. Williamstown, Mass. : Clark Art Institute, 2015. Pickvance, Ronald. Van Gogh in Arles. New York: Metropolitan Museum of Art, 1984. Pickvance, Ronald. Van Gogh in Saint-Rémy and Auvers. New York: Metropolitan Museum of Art, 1986. Rathbone, Eliza et al. Van Gogh Repetitions. New Haven: Yale University Press, 2013. Tilborgh, Louis van, Nienke Bakker, and Cornelia Homburg. Van Gogh and Japan. Amsterdam: Van Gogh Museum, 2018. Tromp, Henk. A Real van Gogh: How the Art World Struggles with Truth. Amsterdam: Amsterdam University Press, 2010. Uhlenbeck, Chris, Louis van Tilborgh and Shigeru Oikawa. Japanese Prints: The Collection of Vincent van Gogh. Amsterdam: Van Gogh Museum, 2018. Born in the Netherlands in 1853 into a Dutch family of ministers (on his father’s side) and art dealers (on his mother’s side), van Gogh left school prematurely. He went to work for a firm of art dealers in The Hague and London, where he acquired some knowledge of art. His fervent social conscience almost led him into the ministry, but he resolved to become an artist instead. This lecture examines van Gogh’s drawings and paintings that depict life in the rural fringes of the Netherlands, his sojourn in The Hague to strengthen his skills, and his brief time as an art student in Antwerp, Belgium, before he moved to Paris. When van Gogh arrived in Paris in 1886, he was a 33-year-old Dutch painter of rural life looking to bolster his meager formal training. He had not yet seen Impressionist paintings, let alone learned of the radical changes in color and design that the Post-Impressionists Georges Seurat, Paul Gauguin, and others of their generation were introducing. During his two years in Paris, he learned quickly. His discovery of Japanese woodblock prints inspired new and joyous color schemes as well as surprising compositions. In this lecture, Walsh traces the artist’s path through various experiences that helped to bring about an astonishing transformation in his work. Seeking freedom from the anxieties of the city and looking for a quiet life of warmth and joy, van Gogh moved south to Provence in 1888. Walsh shows how the artist spent his time in the city of Arles exploring the town, creating a home and workplace, and roving the surrounding flat land, struck by its similarities to his native country. He drew and painted landscapes, adapting his newly acquired colorful brushwork to the strong visual contrasts and hot southern sun. During the 16 months van Gogh spent in Arles, he painted many strikingly original portraits of friends and neighbors. He made plans to create a small artists’ colony there, though the only other member was his friend Paul Gauguin. This lecture considers van Gogh’s artistic ideals and the difficulties posed by his volatile personality, in particular his explosive friendship with Gauguin, who worked with van Gogh for nine weeks before his sudden departure following a frightening altercation. In May 1890, after a prolonged breakdown, van Gogh moved to Auvers-sur-Oise, a town 20 miles from Paris, to be cared for by a well-known homeopath, Dr. Paul Gachet. For two months, he worked hard when his health and the weather permitted. His landscapes from the last months of his life are broadly and forcefully painted, and there are a few heartfelt portraits. He died in midsummer by his own hand. This lecture considers the power of these last paintings as well as van Gogh’s lack of financial success and fame during his lifetime, the posthumous steep rise of his reputation and influence, and the Romantic myths that infuse his biography.